How did Britain come to be in such a mess? It should be clear to anyone that the looming threat of a catastrophic "no deal" Tory strop out of the European Union didn't just happen in isolation, and that there are numerous factors at play. Probably the biggest factor of all is the Westminster political establishment's ideological obsession with hard-right neoliberal dogma. Ever since 1979 neoliberalism has ruled the roost in Westminster. The only period in the last four decades where it's not been Tories pushing hard-right, pro-privatisation, anti-worker, social housing wrecking, bank deregulating neoliberal dogma was 1997-2010 when Tony Blair and Gordon Brown pushed the same ideological madness, but with doses of welfare economics and public service investment to soften the consequences of their adherence to Thatcherite economic dogma. While policies like tax credits, the minimum wage, and investment in the NHS were admittedly far better than anything you'd expect from a Tory government, New Labour's refusal to reverse the worst aspects of neoliberal dogma meant they were absolutely complicit in the ensuing disaster, which came about when the private banks collapsed under the weight of their gambling debts in the 2007-08 financial sector insolvency crisis (you know, the crisis we still haven't recovered from). Instead of allowing the reckless and insolvent banks to go under and be replaced in the marketplace by less reckless institutions (as neoliberal economic theory suggests), the British state decided to institute the biggest state bailout in history. In an unprecedented display of crony capitalism the government pumped £hundreds of billions into the financial sector directly while the Bank of England began magicking money out of nowhere via quantitative easing in order to artificially prop up the value of assets held mainly by the mega-rich. These massive state interventions to save the neoliberalised financial sector from the consequences of their own reckless gambling should obviously have sounded the death knell for hard-right anti-state neoliberalism. If you've spent the previous three decades pushing the lie that state intervention is bad, then you couldn't get a more obvious invalidation of your agenda than an unprecedented state intervention to save the economy from the consequences of your ideological experiment. 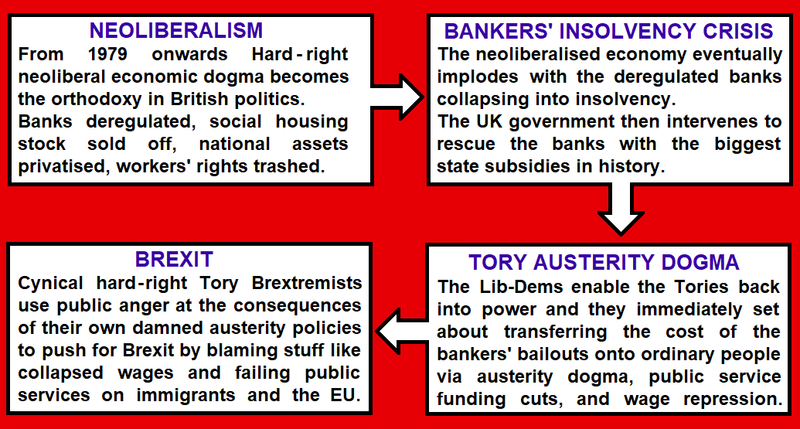 However, when the Lib-Dems enabled the Tories back into power in 2010 the Coalition government immediately set about implementing an audacious strategy of prescribing the cause of the financial sector crisis as their so-called solution to the crisis. So instead of a much needed rebalancing of the economy away from hard-right neoliberal dogma, the Tories actually doubled down on neoliberalism with their ideologically driven austerity agenda. The results of this double-down on neoliberalism strategy were appalling: The slowest post-crisis recovery in Centuries. The longest sustained collapse in the real value of workers wages since records began. Savage local government cuts. The lowest levels of new house building since the 1920s. Home ownership rendered an impossible dream for millions as the private rental slumlords cashed in through the exploitation of people with nowhere else to turn. The NHS is crisis. Social care in crisis. Police and emergency services cut to the bone. Public assets being flogged off at fractions of their true values. Soaring child poverty. Soaring in-work poverty. An exponential growth in food bank dependency. Millions trapped in low-pay insecure Zero Hours Contract and gig economy jobs. Once again the Labour right-wingers were complicit in the ensuing disaster. Instead of standing up and opposing ruinous Tory austerity dogma with all their might, Labour right-wingers like Ed Balls and Chris Leslie actually decided to pathetically imitate it with "austerity lite" (a decision that cost them the 2015 General Election and led to the Brexit vote). If Labour had opposed Tory austerity dogma, it's likely they would have cruised into power in 2015 on a massive wave of public anger. But they refused to oppose it, and left the door open for hard-right opportunists to once again use the consequences of their own hard-right ideological fanaticism as a Trojan Horse to push even more of it. The fact two of the Westminster establishment parties were pushing ruinous austerity dogma in government, while the third pathetically imitated it instead of opposing it left the door wide open for the right-wing fringe of the Tory party (and their Ukipper mates) to pin the blame the consequences of this devastating ideological attack on poor and ordinary people onto immigrants and the EU in order to whip up support for Brexit. Had there been any opposition to Tory austerity dogma whatever, then it's unlikely Brexit would ever have happened. Just look at Scotland where the SNP ran a strong anti-Tory, anti-austerity campaign in 2015, and how the Scottish public overwhelmingly rejected Brexit the following year. Now that the UK is facing the ever-increasing likelihood of a ruinous "no deal" Tory flounce out of the EU (which would trigger an economic crisis even worse than the bankers' insolvency crisis we still haven't even recovered from), surely it's time to accept that the four decade long Westminster fixation hard-right neoliberal dogma is the root cause of Britain's problems, and that the only sensible solution is to actually fight back against it? Of course the majority of the Westminster establishment, mainstream media, and corporate executive class will fight tooth and nail to defend the ideological orthodoxy that they've done very nicely out of indeed. They'll fight back against a change of direction because they fear that undoing some of the damage to ensure that everyone in Britain gets a fair chance might mean that the privileged few lose out a bit. And they're right. The mega-rich should have to pay their fair share of tax rather than stashing their wealth in Panama or the Cayman Islands. Exploitative private sector slumlords should have their profiteering curtailed by decent living standards and rent controls. Greedy property speculators should lose out as the government launches a massive house building drive to ensure that everyone who works for a living can afford a decent home to live in. Private profiteers who have made untold fortunes siphoning wealth out of our public utilities should see their money tap turned off as vital public infrastructure and services are bought back under public ownership. And perhaps most importantly of all, those who have monopolised the top jobs in society thanks to their privileged backgrounds should face some real competition from people from ordinary backgrounds armed with an education that is provided free of charge under a new National Education System. Of course it would be impossible to undo the damage caused by four decades of neoliberal economic dogma overnight (especially against a tidal wave of establishment hostility), but surely it's time to reverse course rather than simply accepting the endless Westminster prescriptions of more of the exact same toxic dogma that caused the problem as the cure to the problem? I mostly agree, but you're missing out the real problem - that the media supports neoliberalism! Good grief! They did so when Labour presented a fully-costed alternative in their manifesto! That was worlds-apart from total opposition to Austerity! I don't know what the solution is, but I'm pretty sure that nothing will change until we have a balance in the media.